Nobel Prize Winner in Medicine says "Human Clone Will Happen In 50 Years!!!" Human cloning could happen within the next 50 years : claims Nobel Prize-winning scientist Sir John Gurdon, the British developmental biologist whose research cloning frogs in the 1950s and 60s led to the creation of the sheep named Dolly in 1996. 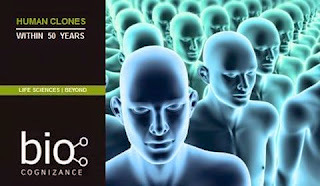 He believes that human cloning could happen within the next 50 years. Gurdon, who won this year's Nobel Prize for Physiology/ Medicine, said that while any attempts to clone a human would likely raise complex ethical issues, he believes that in the near future people would overcome their concerns if cloning is considered medically useful. The 79-year-old scientist explained that people were extremely suspicious of in-vitro fertilization when it was first developed, but after the Louise Brown, the first 'test tube baby', in 1978, the technique was widely accepted and is used now by infertile couples worldwide. He further added that cloning methods would first need to be refined before they can be applied to humans because the vast majority of clones today are deformed.